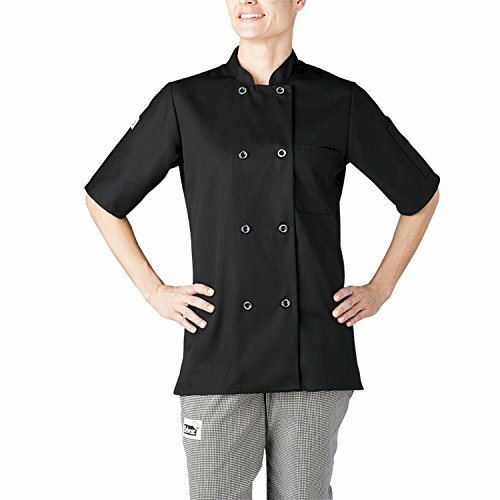 Chefwear's Women's Three Star Short Sleeve Plastic Button Chef Jacket provides a professional look at an unbeatable value. This coat is made with a poly rich fabric that breathes exceptionally well and is designed with a feminine fit that helps keeps you cool while working all day in a hot kitchen; 7.5 oz. 65/35 poly/cotton blend, Durable, wrinkle-resistant fabric, Breast patch and split sleeve pockets, Plastic 4-hole buttons, Square French cuffs. If you have any questions about this product by Chefwear, contact us by completing and submitting the form below. If you are looking for a specif part number, please include it with your message.